The U10 and U20 USB Network Interfaces are low-cost, high-performance LONWORKS interfaces for USB-enabled PCs. The U10 USB Network Interface connects to a TP/FT-10 TP/FT-10 Free Topology Twisted Pair (ANSI/CEA-709 ANSI/CEA-709.3) LONWORKS channel through a removable connector, and is fully compatible with link powered channels. The U20 USB Network Interface connects to a PL-20 PL-20 Power Line (ANSI/CEA-709 ANSI/CEA-709.2) LONWORKS channel through a wall plug coupling circuit/ power supply (included). The U20 interface may also be connected directly to 10.8-18VDC 8-18VDC power lines without a coupling circuit, or to virtually any powered line with a customersupplied coupling circuit/power supply. The U10 and U20 interfaces are ideal for industrial control, building automation, process control, home automation, and transportation applications. The interfaces feature easy-toinstall, auto-configuring drivers for Microsoft Windows XP, 2000, and Server 2003, and are compatible with LNS 3 and Turbo Edition applications, including the LonMaker® Integration Tool. When used with LNS 3 or LNS Turbo Edition, the U10 and U20 interfaces function as LNS High Performance Network Interfaces-you get the highest possible performance at the lowest cost in the market. Apart from the M Low-cost USB to LONWORKS® (ANSI/CEA-709 ANSI/CEA-709.1) network interface M Free topology twisted pair (TP/FT-10 TP/FT-10) and power line (PL-20 PL-20 C-Band) LONWORKS channel support M Highest possible network throughput and performance M Rugged design, removable connectors M Plug-and-play drivers for Windows XP, 2000, and Server 2003 M Functions as an LNS® High Performance Network Interface when used with LNS 3 and LNS Turbo Edition M Compatible with OpenLDVTM applications and the LonScannerTM Protocol Analyzer M CE, UL, cUL, and TüV superior performance when used with LNS, the U10 and U20 interfaces are compatible with OpenLDV based applications, as well as the LonScanner Protocol Analyzer. Models 75010R 75010R, 75110R 75110R, and 75021R 75021R are compliant with the European Directive 2002/95/EC 2002/95/EC on the restriction of the use of certain hazardous substances (RoHS) in electrical and electronic equipment. The U10 and U20 interfaces are certified USB 2.0 compatible by the USB Implementers Forum. In addition, the U10 and U20 interfaces carry the Designed for Windows XP logo compatibility certification. A 60cm USB extension cable is included with both the U10 and U20 interfaces, to allow for easy connection in various laptop and desktop environments. An optional 3 meter cable accessory is available for the U10; this cable accessory allows easy network connection between the U10 and LonPoint® Routers, the MPR-50 MPR-50 Multi-Port Router, and the numerous third-party devices that implement the 3.5mm mono phone plug standard. Installation software and a user's guide are included on the CD-ROM, and may also be downloaded from Echelon's Web site. U10 Interface: Removable spring clamp and screw terminal connectors included. U20 Interface: 2.1mm barrel connector with positive tip. Wall plug coupling circuit/power supply included. May be connected directly to 10.8-18VDC 8-18VDC power line, or to customer-supplied coupling circuit/power supply. 3 meter cable with 3.5mm mono phone plug and spring clamp connector 10.8-18VDC 8-18VDC at 2.1mm barrel connector; powered line voltage varies with application 250mA maximum @ 18VDC 18VDC 50mA maximum @ 5VDC Certified USB 2.0 compatible. Compatible with USB 1.1 and Hi-Speed USB systems, peripherals and cables. 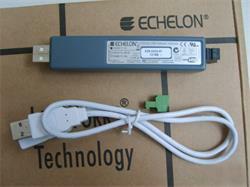 Echelon Model Number 75010, 75010R 75010R 75110, 75110R 75110R 75020-1 75020-2 75021R 75021R Copyright © 2005-2006, Echelon Corporation. Echelon, LON, LONWORKS, LONMARK, LonBuilder, NodeBuilder, LonManager, LonTalk, LonUsers, LonPoint, Digital Home, Neuron, 3120, 3150, LNS, i.LON, LONWORLD, ShortStack, LonMaker, Panoramix, Panoramix Powered by Echelon, the Echelon logo, and the LonUsers logo are trademarks of Echelon Corporation registered in the United States and other countries. LonLink, LonResponse, LonSupport, LONews, Open Systems Alliance, OpenLDV, Powered by Echelon, LNS Powered by Echelon, LONWORKS Powered by Echelon, Networked Energy Services Powered by Echelon, NES Powered by Echelon, and Digital Home Powered by Echelon are trademarks of Echelon Corporation. Other trademarks belong to their respective holders. Disclaimer Neuron Chips, Free Topology Twisted Pair Transceiver Modules, and other OEM Products were not designed for use in equipment or systems which involve danger to human health or safety or a risk of property damage and Echelon assumes no responsibility or liability for use of the Neuron Chips or Free Topology Twisted Pair Transceiver Modules in such applications.